Hundreds of Bucks County Catholics who streamed into St. Joseph the Worker Church on Sunday, July 26 were pilgrims, in a way, visitors to a church that for them represented decades of worship, sacraments, social ministries, carnivals and education. It was the last day they could visit the church building that closed for good on June 30. An agreement of sale for part of the church property was signed recently. 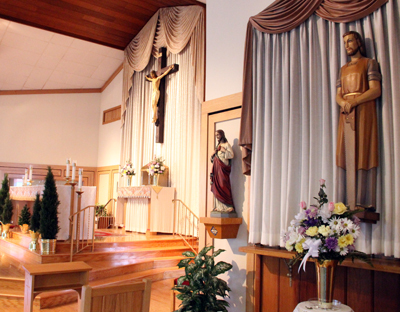 St. Joseph’s had been designated a worship site after the Fallsington parish’s merger with St. Frances Cabrini Parish in Fairless Hills last year. The merger was part of a group of five parishes in lower Bucks County that merged into new parishes. Fallsington resident Robert Hedden started his education at St. Joseph the Worker School, and had nothing but praise for the Bernardine nuns who gave the children in their care “the best education,” he said. 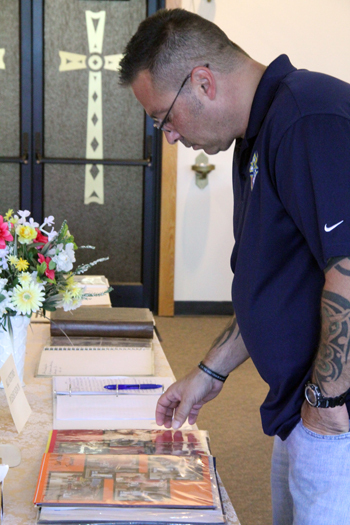 Sunday’s visit to the church was an emotional benchmark for Hedden, a former Falls Township fire chief who is currently a firefighter in Montgomeryville. “This is still very unsettling on a personal level because I think of the family baptisms, weddings and funerals held in this church,” he said. “Today is reminiscent of the people here who became interwoven with my family, and with other parishioners. This church has the look of the people who came here: postal workers, steelworkers, police officers and firefighters. It has the look of a church for the common man,” Hedden said. In the early 1950s, U.S. Steel opened its Fairless Hill plant, bringing thousands of families of World War II veterans, and transplants from rural Pennsylvania, to Lower Bucks County for work. Farmlands gave way to housing developments and shopping malls, creating the demand for schools and churches. 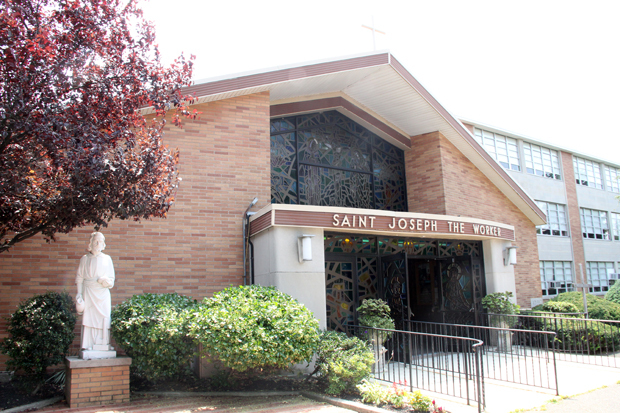 St. Joseph the Worker Parish was founded soon after, in 1956. Today, the steel mill is a skeleton of its former self, the area’s population is aging, technological jobs have replaced much of the local industry and the area struggles to reinvent its commercial viability. Those factors, plus skyrocketing costs of running a parish, fewer priests and declining attendance at liturgies have taken their toll on local churches. The parish school closed five years ago and merged, along with Queen of the Universe, Immaculate Conception and St. Frances Cabrini schools, into the newly created Holy Family Regional Catholic School in Middletown Township. St. Joseph’s use as a worship site ended after the parish entered a pending agreement to sell a large slice of the church’s property. Karen David, formerly the business manager for St. Joseph the Worker and now for St. Frances Cabrini, said the parish has a signed an agreement of sale with McGrath Homes, but there is no settlement date yet. McGrath wants to build an over-55 community on the property. The archdiocese and McGrath are awaiting the approval of a zoning change by Falls Township supervisors before they can move forward. David said that the fields behind the church and the convent and rectory buildings would be part of the sale. The church and the social hall are not included in the agreement. 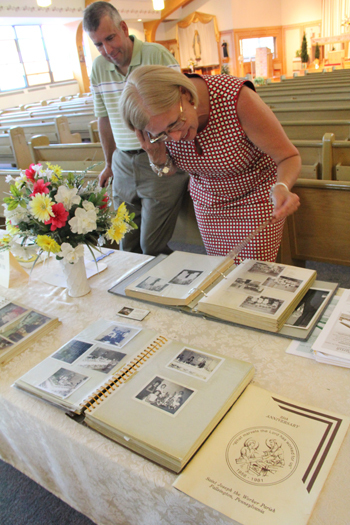 Sunday’s open house offered an opportunity for parishioners to take one last look before the removal of items from the church. Those items that have special meaning for parishioners will be incorporated into St. Frances Church. “It’s important to make sure that the things with spiritual meaning be included, like the Statue of St. Joseph the Worker that stands in front of the church. 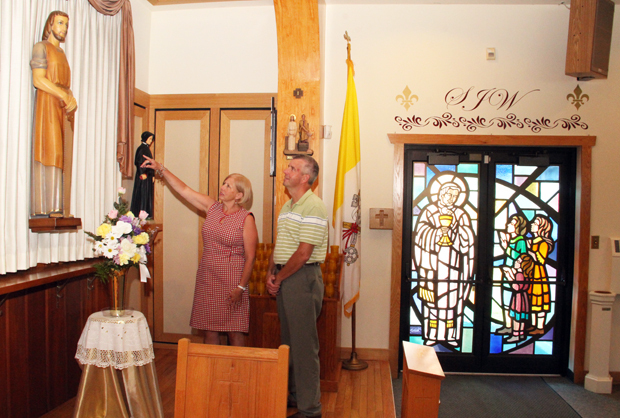 This will be taken to St. Frances Cabrini,” David said. In addition, St. Frances Cabrini is preparing a room for an adoration chapel to replace the small structure near the rectory at St. Joseph’s, where worshipers could stop in around the clock for silent prayer before the Blessed Sacrament, or making use of the rosary beads and many religious prayer books and publications available on nearby racks. Adding to the poignancy of the day was the news that one of St. Joseph’s – and now St. Frances Cabrini’s — most active members, Betty Russell, died on Saturday at the age of 82. For many years, Russell operated Martha’s Cupboard out of the former parish’s garage, collecting non-perishable foods, baby supplies, furniture and other items for those in need. Father Donald Birch, retired pastor of St. Joseph the Worker, recalled that Russell was one of those parishioners whose devotion to her faith and her community comforted him and inspired him in his own faith. Father Birch, who currently lives in Buckingham, made the trip to Fallsington on Sunday to make his own farewell to the parish he shepherded for 14 years. “Betty Russell was one of those people who rounded up stuff from everybody. Nobody could say no to her,” he said. Msgr. Michael McCormac, current pastor of St. Frances Cabrini, said Russell continued to attend Mass until shortly before her death. “She had such energy and she generated such energy. She inspired others to do the work of Jesus,” Msgr. McCormac said of Russell. Despite the passage of a year since the merger was announced, Michael and Cathy Taylor admitted to being shocked when the reality of the final tour kicked in. Michael grew up in St. Joseph the Worker; Cathy is a convert to Catholicism. Both find the break from their spiritual home painful. Helen Altmiller raised her seven children as members of St. Joseph the Worker. She has been an active member of her parish, serving as an extraordinary minister of holy Communion. When word came of the merger, Altmiller, like many members in various ministries at St. Joseph, felt trepidation. What roles would they have at St. Frances Cabrini, they wondered. Members of the choir, lectors and others hoped to continue their work in their new surroundings. They soon found that Msgr. 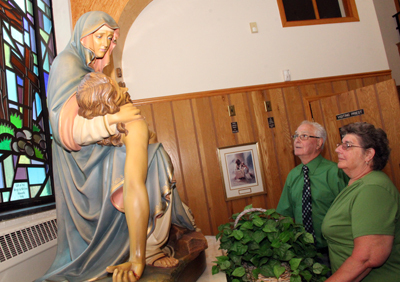 McCormac and several St. Frances committees had already planned meet-and-greet sessions to welcome the new parishioners. The various ministries would be absorbed and the rosters revamped to make sure everyone could continue to use their talents. Altmiller said she and her fellow parishioners’ welcome was warm and heartening. One last sorrowful vestige of the Catholic values St. Joseph the Worker clung to was a final visual as motorists exited the parking lot: lines of white crosses planted in the ground, each representing 1 million abortions performed since the U.S. Supreme Court’s 1973 Roe v. Wade decision. the problem is that there are not large numbers in attendance as there were when these parishes and churches were established. We are witnessing the same problem in the CAMDEN Diocese…in recent years the Number of parishes has been reduced from 124 to 69 or 70. As I have wondered what was to happen to these abandoned churches, we have heard recently that our closed parish complex , school, convent , rectory and church would be torn down and a shopping center would be built . Interesting sign of the times! in South Jersey. Memories of Levittown and St Joseph Parish are very happy. It’s sad to learn of its closing. Having lived thru 2 of such closures, and another merger thus night in NYC of the Church of Our Lady of Peace, I continue to feel the hurt. There has to be a better way, and pray that more if us can be the accepting people as with those of St. Joseph the Worker.